Dogwood is a simple free-motion quilting pattern that I recommend to anyone who likes the look of a simple, allover quilting pattern. To achieve the regular pattern, start with a 2" (or similarly sized) grid of squares. For the sample in this post, I drew a grid using a water soluble marker and my quilting ruler. However, this is a perfect quilting pattern for a quilt that is, itself, a grid of squares. When I do this quilting pattern on a larger quilt, I mark the quilt after I sandwich it, but before I pin baste. For something small like the placemats or a mini quilt, it may be easier easier to mark the tops before sandwiching. Look for a marker that is "water soluble," not "disappearing ink" or "air soluble." The latter two may disappear before you're done quilting! Water soluble markers are often blue. Choose a thick marker for this task. Marking a lot of lines with a fine-point marker can be tedious. Always test your marker on scrap fabric to make sure it will actually go away. When marking on your project, mark as lightly as possible. You want to be able to see your lines, but you don't want to have to drench your project in water to get them to disappear. For this pattern, work in columns, starting at the bottom of a column and working up (pulling the project toward you as you work). On this small sample I started with the column on the far right and worked my way, column by column, to the left. On a larger project, I would have started with a column near the center and then worked out to each side. Besides working in columns, this pattern makes use of the "margins" of the quilt sandwich that will eventually be cut off. On most projects, that would be the part of the batting and backing that is larger than the top. On my sample, it's the area outside my 2" grid. Starting in that margin, draw up your bobbin thread, make a knot and stitch to the center of the bottom square in the column. From the center, quilt a petal shape in the lower-left quadrant of the square, returning to the center. Quilt a second petal in the upper-left quadrant, once again returning to the center. Repeat this process to quilt petals in the upper-right, and lower-right quadrants, returning each time to the center. Once you have a completed dogwood flower, move to the center of the next square (the square above the one you were just working on). Quilt a dogwood flower in that square. 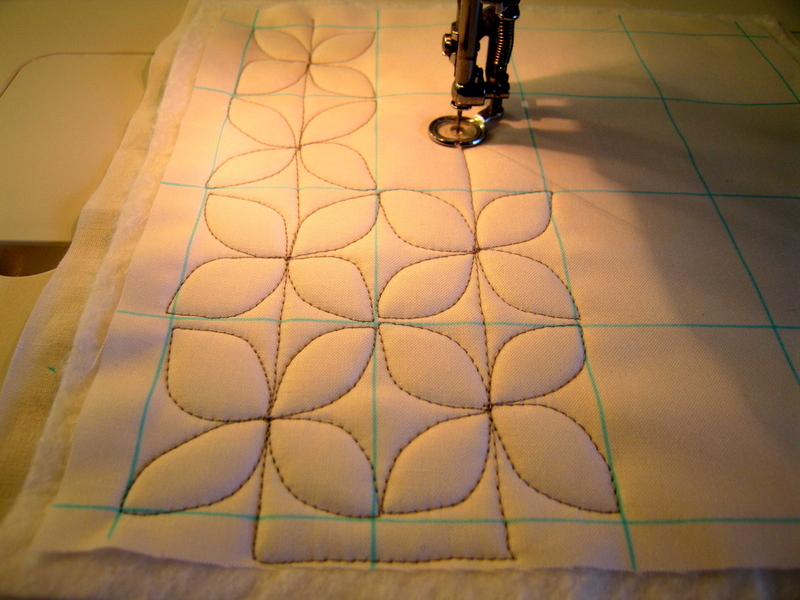 Repeat the process of quilting flowers in each square, moving up the column until you reach the top. Stitch off the quilt top and into the margin. Rotate your sandwich 180 degrees. Use the margin to move over to the next column. Quilt to the center of the bottom square in that column and proceed with quilting flowers in each square, until you finish the column. Continue this process, zigzagging back and forth, up and down the columns, until you've quilted the entire area. As you work, continue to rotate the project 180 degrees at the end of each column. It will be much easier if you are always pulling the project toward you as you quilt! Even if you're not doing this pattern, when free-motion quilting on a home machine, I've found that pulling the quilt toward me, rather than pushing it away (as you would have to do if you were using the feed dogs) is a lot easier. It makes it much easier to see what you've just done. If you plan to wash your project before using it, the marker should come out in the wash. If you prefer not to wash first, use a spray bottle to mist your project with water. Note: The bottle in the photo is water, not hair product! It can be tricky to strike the right balance with the water. You want to spray enough to make the ink disappear, but not so much that your project is soaked. Be especially cautious if you have bold, contrasting colors in your project. Even if you're using fabric that wouldn't normally run in the wash, leaving the project wet on a hard, non-absorbent countertop may be problematic. Placing towels underneath can help to soak up excess water that might otherwise pool and cause bleeding. You may find that some ink lines disappear and then come back. This usually means that they didn't get enough water the first time. If this happens to you, just mist that area a second time. Once your project is dry, trim it to the desired size. As you can see in my sample, I've trimmed away the margins, so you can no longer see the places where I moved from one column to the next.